This past Spring Break, Madison headed to Walt Disney World with the school band to participate in the Disney Performing Arts Workshop. Despite our many trips to Disney as a family, this experience would be unlike any of those. Not only weren’t we going with, but she would be with friends who have different interests than hers. Although I was able to get her onto Rock ‘n Roller Coaster, there was nothing I could say to convince her to ride Expedition Everest with me again. The memories of her first trip on it when she was young were enough to convince her not to want to ride it again… ever. Peer pressure can be a good thing sometimes. She discovered that the anxiety, the stomach in your throat feelings and the rush of adrenaline were awesome. 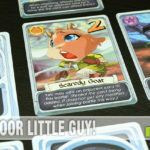 Games of speed are like the roller coaster of board games! As we explained with Parademics: Clear!, they can be a rush of adrenaline. 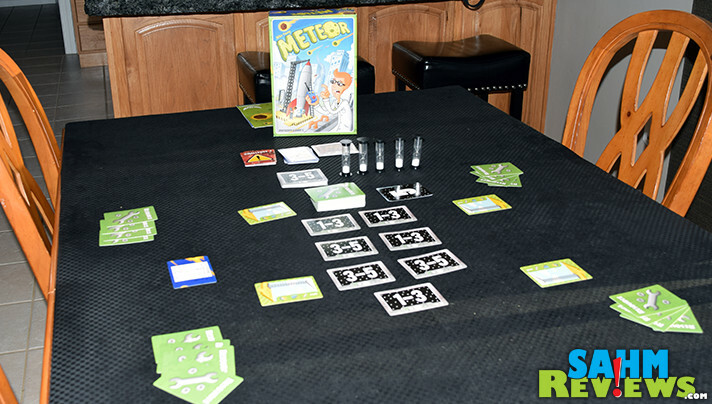 Meteor from Mayday Games is another example of a game that will have your heart racing for the five minutes it takes to play the game. Okay, maybe not yours but definitely mine! After all, meteors are on their way to smash into the planet and we’re tasked with saving the world and we only have FIVE minutes to do it! It’s almost as scary as trying to be the sole survivor on a moon going to explode from all the moonquakes. 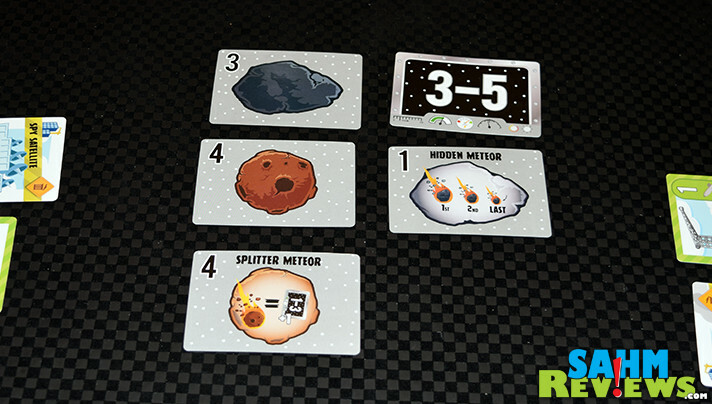 To set up Meteor, determine the number of players (play solo or up to 5 total) and create a Meteor Field with the appropriate number of cards. 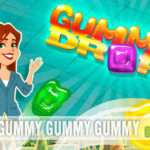 Place them face down in the center of the table within reach of all players. 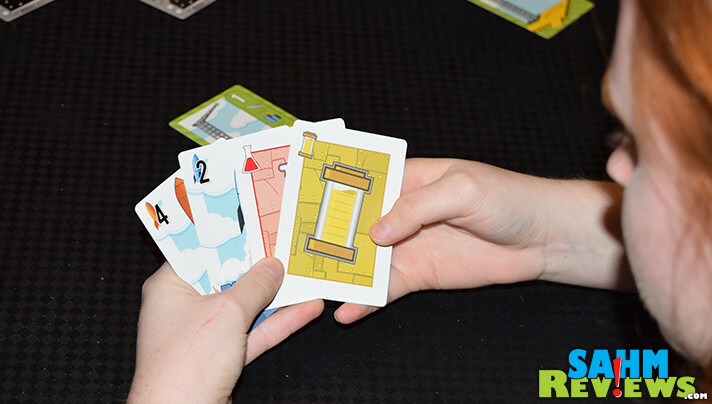 Give each player a Launch Site Leader Card along with the appropriate number of Resource Cards to coincide with the number of players. The remaining Resource Cards will be placed near the Meteor Field. Determine who will be responsible for tracking the time and place all five sand timers and the Altitude Cards near that player. Play takes place over five one minute rounds. Each player has a launch site that they can use to create technology, upgrades or rockets. You must be the first person to place something on your launch pad but after that, any of your teammates can add to it to help fulfill your objectives. 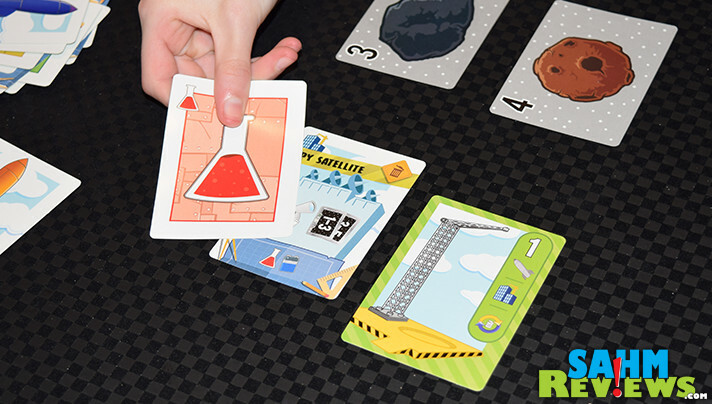 The goal is to use Resource Cards to build and launch rockets to destroy the incoming meteors. The meteors are lined up in five rows depicting their distance from earth. Like a game of Space Invaders, you’ll need to destroy the ones closest before they reach Earth. At the end of each round, the meteors all advance one step closer. 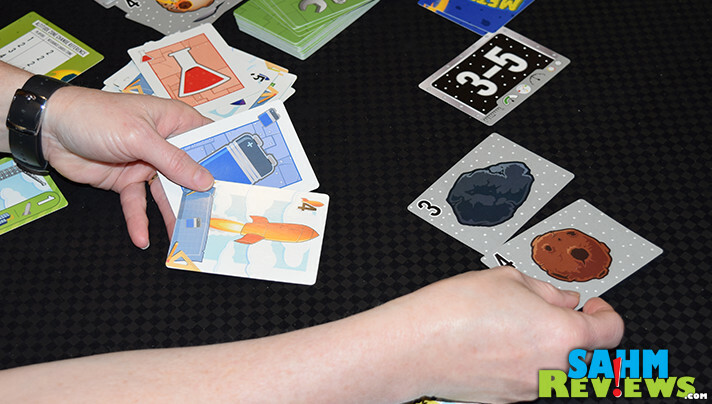 Each rocket card shows how many resources are needed to launch and it can only destroy a meteor that is equivalent in value or less. If the rocket is lower value than the meteor, it doesn’t do ANY damage so multiple teammates will need to shoot rockets at the same time to destroy it. But if you fire too much power, it has adverse effects. Too much energy causes the other meteors to immediately move closer. In other words, it ends the round. As such, planning is crucial. Unfortunately, talking isn’t allowed until the proper Technology Card has been built. 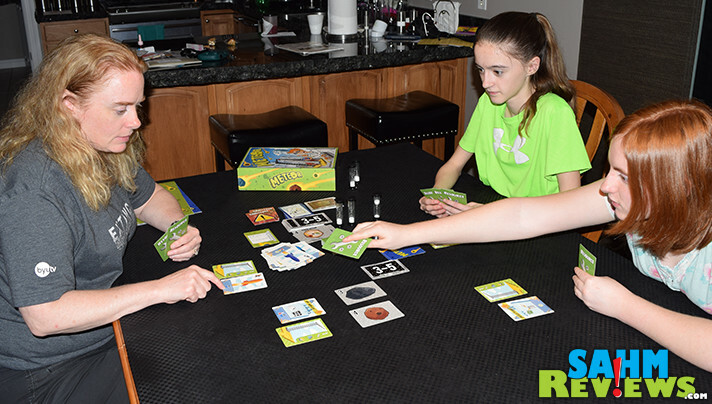 Don’t worry… when you’re first learning the game, you’re encouraged to communicate with other players to get a feel for the game play. Other technology cards allow you to reveal the value of the meteors, draw additional resource cards or exchange two cards from your hand for a Rocket Card or Energy Card from the discard pile. 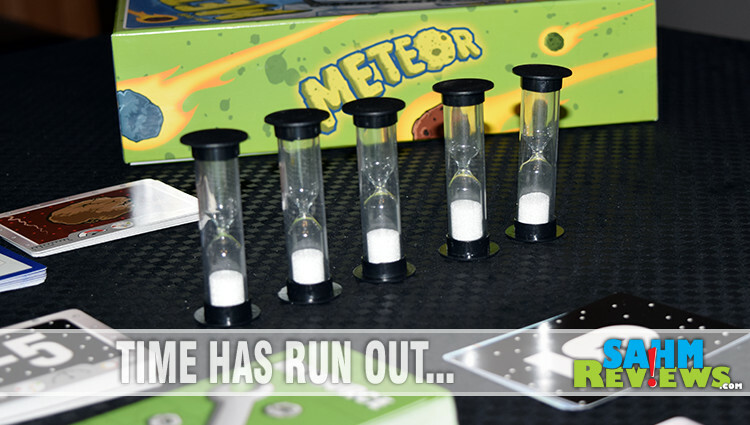 Should any meteor advance to Earth at the end of a round, the game is over and all players lose. If you and your teammates are able to destroy all the meteors before the sands in the last hourglass drop, you all win. As I describe it, it doesn’t sound too anxiety inducing, but for me, timers in games are like stethoscopes are for most people. They increase my blood pressure! 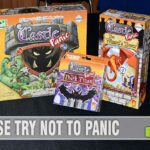 If it feels too easy for you, don’t worry… there is an advanced level that includes Challenges, Boss Meteors and Power Cards. In addition to being a short game, one of the advantages of Meteors is that it’s extremely affordable, currently running under $10 on Amazon! That makes it an excellent addition to the game shelf to play in-between longer games or for when time is short. It’s also a nice gift idea for tweens and teens. Launch Twitter and Facebook to see what other products Mayday Games has in orbit. In the meantime, target your sites on this giveaway and enter to win a copy. Yes, I have. It was fun to watch. I have never witnessed a meteor shower but I have been fortunate enough to see the Northern Lights. I have seen a meteor shower. In the summers years ago, I would stay up late and watch the Perseid meteor showers. I didn’t really see a shower of meteors, more like a few shooting stars. The meteor showers were never as impressive as they claimed. No I have not seen a meteor shower and I can live the rest of my life without seeing one! I have never seen a meteor shower. I almost always try to catch the Perseid Meteor Shower in August each year. It is pretty cool how fast they come at the peak times! Yes, I have seen a meteor shower. I like to take my kids out camping if I can when they come so we get away from the city lights. I have not ever witnessed a meteor shower. No, I have never witnessed a meteor shower. Many, use to make it a habit to stay out late yearly for the bigger known showers. Yes, I have. Definitely fun to watch. I have occasionally seen a single meteor fall, but never a shower of them. Yes, many years ago in Alabama when Haley’s comet was passing through….spectacular! I have never seen a shower, but I have seen a meteor before. It was so cool! I have never witnessed a meteor shower.